A man has been stabbed to death in a brutal attack by a tout in Awada, Idemili North Local Government Area of Anambra State. The deceased is reportedly the only child of his parents. The suspect, Ifeanyi Ali, reportedly stabbed the deceased, 24-year-old Chigozie Alo, a tricycle rider, to death for refusing to give him N200. Saturday PUNCH learnt that the suspect had hitched a ride with Alo and on getting to his destination, demanded the sum from the rider to buy a local gin at a drinking joint in the area. The Izza, Ebonyi State, indigene was said to have explained to Ali that he did not have money on him as he had just started work for the day. The victim, however, reportedly asked the suspect to buy the drink on credit, promising to pay the seller later in the day. The 24-year-old wanted to zoom off when Ali reportedly stabbed him with a broken bottle from behind and fled the scene. 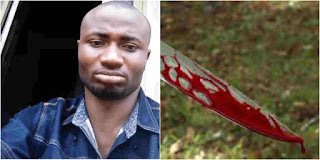 The young man, it was gathered, bled to death.The case was reported at the Okpoko Police Division after, which the suspect was arrested. .
Alo’s parents, who spoke with Punch on Thursday, said he was planning to get married later this year before the incident happened. “On May 13, 2018, he carried Ali to where he was going. When he got to where he was going, he asked my son to give him money to buy a drink at a joint. Chigozie told him he did not have money and promised to meet him at the bar to pay for the drink. “But the man seized his tricycle key; held him from the back and stabbed him with a broken bottle. That was how he killed our only child. He was our only hope. We wanted to get him a wife this year. It was very painful. The deceased’s mother, Elizabeth, could not hold her tears during a chat with PUNCH, lamenting that her decades of labour had ended in futility.